Here are 9 alternative sources of funding for entrepreneurs and artists who are trying to raise capital for their startup or project. 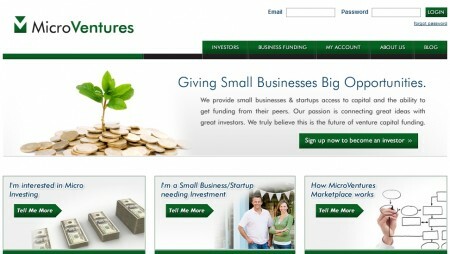 These companies pay $100 to MicroVentures and then send their business plan to the site for approval. Once approved, this idea will be posted on the website for serious investors to consider. 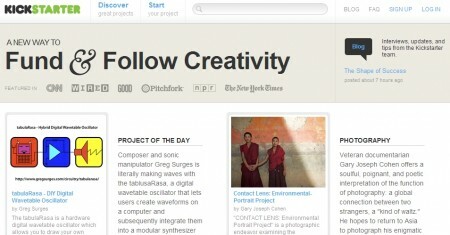 Kickstarter is a crowdfunding site that is getting a lot of attention these days. With creative people posting new projects that need funding every day, this site is a place where the bohemian idea can turn into a viable possibility. The process is simple and a person can setup their Kickstarter project in just a few hours. A person posts their project details and creates a funding goal. During a certain period of time, investors and individuals are able to contribute so that the project meets or exceeds that goal. The project will only get the funding if the goal is met. When the project creator reaches their goal, Kickstarter takes 5% of the monies for their service. If you’re a designer who needs to have financial support, Quirky is a crowdfunding site that supports your creative and inventive needs. The most valuable part of Quirky is the feedback you can receive for your project idea. For a $10 fee, you can post your idea and then see what others think about it. This allows you to create a product or service that is going to meet your market needs, increasing your chances of success. Once you have received feedback, then Quirky will decide whether or not they want to make the product. If they do, then you get paid. 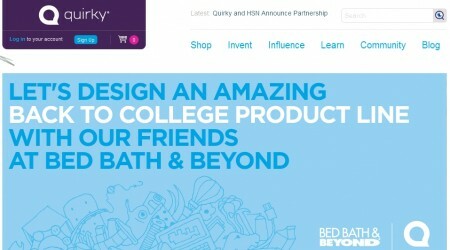 With the community vibe, Quirky is more of a progressive site than a straightforward investment site. 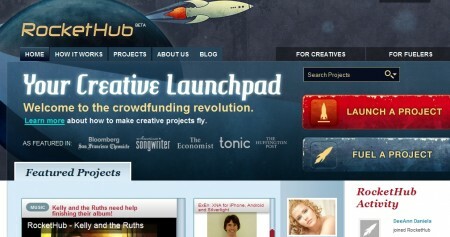 At RocketHub, you will find there are two audiences this crowdfunding site helps: Fuelers and Creatives. Fuelers are the ones who invest in the projects that the Creatives post. Unlike Kickstarter, there is more interaction on the RocketHub site, with plenty of resources for those who want to refine their idea before or after they post it on the site. Users can earn rewards or badges on the site in order to promote each other. On RocketHub, there is a flat rate of 8% for Creatives who receive investments from Fuelers. 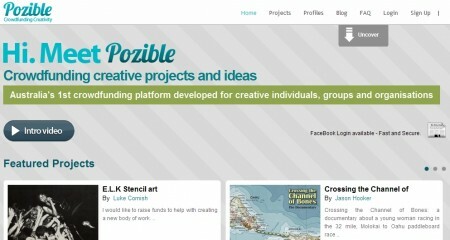 When you look at Pozible, you will notice this is another crowdfunding site that offers many of the same tools as other sites already listed. What users will want to keep in mind is that local projects that are not based in Australia may not be as well received on this Australian website. Like other sites, companies and individuals will post their projects on the site and then investors will decide whether to invest in the projects or not. Fees for using Pozible include 2.4% for PayPal transactions, 5% for invitees, and 7.5% for everyday users. 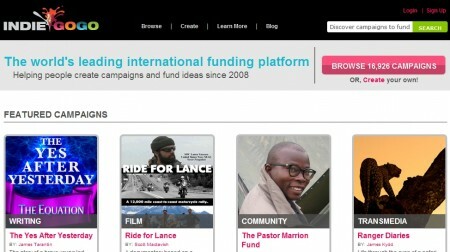 With IndieGogo, you’ll find a creative crowdfunding site that’s interested in everything from performing arts to gaming ideas. Since one of the partnerships with IndieGogo is MTV, this is a valuable resource for those who want to break into the music and entertainment industry, but need the funding to get started with their unique idea. Like Kickstarter and others, you will need to meet your funding request before you can receive the funds. What sets IndieGogo apart is its use of pre-sales and rewards, which can create buzz for a project, even before it is funded and ready for the public eye. 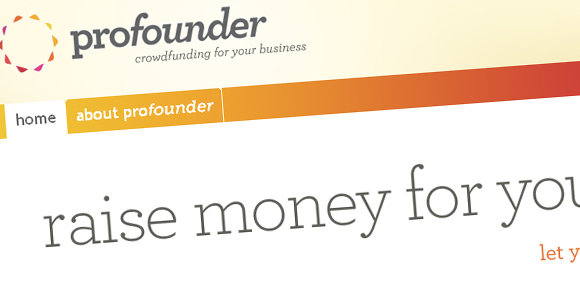 If you’re interested in creating an open source software project, then CoFundos is the right crowdfunding site for you. Here, developers can post their open source software ideas, get feedback, and then request funds to continue to develop the project. You can post an idea and developers can agree to make your idea into a real program. While funding is not the only source of assistance on this site, donations are expected from those who decide to bid on a project idea. Here, posters will post their ideas and then investors will come along and help fund the idea. Since there is a reward system in place, investors are compelled to invest more as they will get more for their investment when they do. And the biggest plus of this European (beta) site is that there are no additional fees outside of the PayPal processing fees. Crowdfunding is a new way to make sure that smaller companies and artists get the funding they need. By spreading out the investors, funding isn’t as difficult to achieve, but success is. Profounder operates on the basis that inside everyone’s social circle both online and offline – there are people who are willing to support your dream. Each of those people potentially becomes an investor in your company, and equity is split amongst them. Profounder gives you the tools to raise the capital that you need, and the tools to manage all of the associated book-keeping, legals and compliance fillings. Right now, the site is still very much in alpha status, with registrations due to open in the Autumn. Still you can sign up for status as an ‘alpha entreupreneur’ if you want to start earlier than that, and are serious about using the system. From our friends at Inc.com. Here are six funding sources worth investigating. These are grants with strings attached. The way it works is that IDAs are savings accounts that match the deposits of individuals with modest financial means. For every dollar saved in an IDA, savers receive a corresponding match. Savers agree to complete financial education classes and use their savings for an asset-building purpose such as to capitalize a business. There is no limitation on how long you can be in business but there income requirements which vary by county. Typically revenues for business owners fall under $50,000. In addition to earning matching dollars, savers learn about budgeting and receive additional training before purchasing an asset. For example, programs in Oregon let participants save $3,000 and the agency can match them with $9,000, allowing them to use a combined total of $12,000 towards building their business and without having to repay the funds. For more info, review the IDA directory. The U.S. Department of Commerce’s Minority Business Development Agency (MBDA) recently announced $7.8 million in funding for 27 MBDA Business Centers (MBCs). These centers help minority firms with access to markets, contracts, capital and other strategic business consulting services. MBCs interface directly with minority business owners and managers at the local level. Whether it’s securing working capital from a lender, applying for an SBA loan, or responding to a grant proposal, MBCs help business owners prepare a funding package. Last year, MBCs helped their clients gain access to more than $800 million in financial packages, including working capital, equity investments, and bonding. This type of a loan is made with the understanding that if the borrower meets certain requirements, repayment of the loan will not be required. A forgivable loan is actually a grant, says Ough, “because if you do everything right you don’t have to pay the money back.” A stipulation may be that you are required to hire and train employees, Ough explains. She cites for example a particular forgivable loan program that allowed recipients to hire up to five employees. “For every employee you hired you were given $5,000 for each. So, you had up to $25,000 you could use for anything related to supporting the growth of your business.” As a growing business, you are going to be hiring employees anyway. This program gives you an incentive to do so, adds Ough. The Regional Investment Board manages lottery funds in Oregon which are used for economic development purposes. These monies are available to entities in the form of grants or loans to support projects that will create jobs in the region. Just as well, you may be able to take advantage of other state loans programs and loan guarantees. Poor credit history is a barrier for many entrepreneurs seeking traditional financing. “If you have not positioned your personal credit such that a bank will find you to be a strong enough credit risk, they won’t lend to you,” says Jennifer Spaziano, vice president of business development at ACCION USA, a microfinance institution that lends to 48 states across the U.S., providing loans to upstarts, especially women and minority businesses. ACCION New York is one of hundreds of regional and national nonprofit groups that make micro loans from as little as $500 up to $35,000. Many of these groups are funded by The U.S. Small Business Administration. Cities like San Francisco and New York City have expanded or introduced their own microfinance programs. Each organization has its own lending requirements. ACCION USA has provided over $119 million in over 19,000 micro loans since inception in 1991. To learn more, visit the Association for Enterprise Opportunity’s website. There is a lot of talk and excitement around technology, particularly coming from the Obama Administration. Review the possibility of obtaining a Small Business Innovation Research (SBIR) grant or Small Business Technology Transfer Program (STTR) funding. You might not be in a position to go after venture capital, yet you may need initial funding for early stage research and development, says Ough. For instance, “we are working with a client who has developed a new process for providing a better educational tool for kids with autism. We pulled out an application to apply for the grant through the National Institute for Health.” The SBIR program was established by Congress in 1982 as a means of stimulating innovation with more than $ 2.2 billion dollars set aside annually with first phase funding of up to $100,000. Phase two is a $750,000 award. The SBIR/STTR program reaches out to socially and economically disadvantaged firms. The participation rate of minority- and women-owned firms in SBIR/STTR just within the Department of Defense is roughly 21 percent. Two sites to check out are Zny and SBIR.gov. For companies looking for commercial ownership or to own their own facility, Ough suggests exploring new market tax credits. This federal program is administered by the U.S. Department of Treasury Community Development Financial Institutions Fund. Designed to provide investments to projects and businesses in low-income communities, the program has expanded to include investments in minority business. NMTC permits taxpaying investors to receive a credit against their federal income tax liability for making qualified equity investments in designated Community Development Entities (CDEs). The credit is spread over seven years, amounting to roughly 39 percent of the investment made in a qualified entity. Many states have passed a tax credit for minority business. The provisions and limitations of these credits vary from state to state. Many of them resemble the New Market Tax credit and give tax credits against state income tax to investments that are used to support minority building projects or encourage minority business ownership, which includes women-owned businesses. However, these credits are extremely tough to get and are highly competitive. In addition, contact your National Chamber of Commerce. There are a number of national chambers of commerce specific to women and minority sectors that offer access to funding sources, including the National Women’s Chamber of Commerce, the Hispanic Chamber of Commerce, the National Black Chamber of Commerce and the Native American Chamber of Commerce. “To find all the funding sources available in your community, you need to become a great connector so that you get familiar with all the programs available for starting and growing your business,” says Ough. 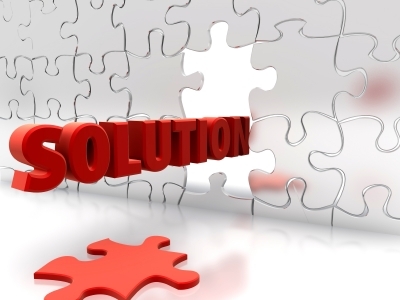 “If that’s not possible, then the next best thing is to find those connectors that can guide you.” Connectors are the top ten businesses, organizations or key players in your community that you get referred to when you are trying to find resources and funding for your specific business. Business grant competition via crowdfunding to give mom entrepreneurs a better chance at launching a new or current business project. All participants win a half-page feature in Moms In Business Magazine, publicity on peerbackers.com and momsinbusinessgrant.com, and a $2,000 publicity toolkit from PRNewswire. When the crowdfunding competition ends, all grant applicants who raised 80% or more of their funding goal will become semi-finalists. A team of mom executives and entrepreneurs will judge each application to determine the $10,000 Grand Prize Grant Package winner. Competitors must be a member of NAFMIB. New York Entrepreneurs…Win $15K to Start a Business!!! 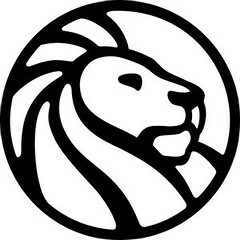 The New York Public Library, with its sponsor, Citi Foundation, announces the New York StartUP! 2011 Business Plan Competition for New York-based startup entrepreneurs with cash prizes totaling over $30,000. The second annual New York StartUp! gives aspiring entrepreneurs the opportunity to bolster their business acumen. Competition is open to those who are 18 years of age or older; live in Manhattan, The Bronx, or Staten Island as a legal resident or U.S. citizen; and wish to start a business in Manhattan, The Bronx, or Staten Island. 1st Place Award: $15,000. 2nd Place Award: $ 7,500. 3rd Place Award: $ 5,000. 4th Place Award: $ 1,500. 5th Place Award: $ 1,500. New Contests for Entrepreneurs….enter now!!! Here are some new contests! MOO.com is giving away more than $250,000 worth of design services and MOO products to 500 small businesses. Each winner will receive a one-time business card redesign by a professional design team and 50 free Business Cards from MOO. 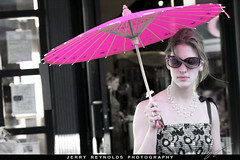 Check out a great “before and after” on the site. Women entrepreneurs, executives and organizations are eligible to enter in 54 different categories. Request an entry kit via online form. How do you impress your customers? Tell Vistaprint and enter to win a customized marketing campaign crafted by their in-house creative experts to promote your business and a $600 gift certificate to HP for a total prize package of $10,000! A nationwide contest for business owners interested in an initial launch of franchising his/her business. The winner will receive $87,000 in business services . The Franchise Council (TFC) in partnership with Franchise Brokers Association (FBA), an industry association, will manage the contest that runs from June 1 – September 6, 2010. Winners will be announced at the Small Business Innovation Summit and Expo in Charleston on Nov. 3. The grand prize winner will receive $5,000 of seed money for his or her business idea, a scholarship to a FastTrac entrepreneurial training program, tickets to the Small Business Innovation Summit and Expo and a Dream Team of Mentors to help cultivate the idea. Five first place prizes of $2,500 will be awarded in the categories of Bio-Science, Software/Information Technology, Engineering, Environmental Sustainability and Wild Card. Each winner will receive a scholarship to FastTrac and tickets to the Small Business Innovation Summit and Expo. There will be five $1,000 honorable mention prizes distributed as well as in each category. What is an Everyday Hero? It’s a person who knows how to use his/her office tools to make things run smoothly; a person to whom everyone turns to pull it all together in a pinch; an individual who quietly gets the job done — often without being recognized. Everyday Heroes can enter the contest now at accoheroes.com. ACCO Brands will award a grand prize of $1,000 redeemable at office product dealers to one winner in each of three categories — business, home/home office and school. Have you put off starting your own business because you don’t have the start-up capital or know enough about marketing, accounting and other business skills to turn your passion into your own company? Then you’re in luck because you have the chance to win a full suite of business services valued at over $20,000 from some of the biggest names in Tampa — all you need is an idea and the drive to be successful! They will be accepting applications until July 30th, so be sure to move fast, and be sure to visit their website and stay tuned to Fox 13 for updates. Have an Idea for a marketing firm?? then listen up, there’s a million dollars up for grabs . Entrepreneurs are invited to submit business plans for agencies in any area of marketing communications. MDC will review the submissions, choose at least one plan from among 10 finalists and invest $1 million in starting it up in exchange for a 51 percent stake in the new shop (giving up 51 percent of the company means you will not have control of the company. Effective control rests with the majority stakeholder, so make sure you are okay with that before you proceed). Please send proposals to MDC at this e-mail address: startup@mdc-partners.net. If you have any questions or comments, please feel free to fill out our comments box.